What is Menopause? 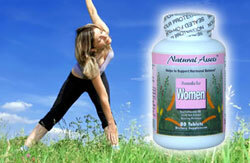 Menopause Definition & Natural Treatments. Menopause is a process which unfolds over several years, during which a woman's menstrual periods cease occurring each month, signaling the end of the fertile period in a female's life. Once a woman goes through this process, she can no longer become pregnant. It is not a medical condition, but rather, a normal function of aging, and as natural as one season following another. From a physiological point of view, menopause occurs when a woman's ovaries cease producing the hormones estrogen and progesterone. Typically, this process begins in a woman's late 40's and early 50's, which imparts to the menopause definition the added characteristic of being an opening of a new phase in life. Yet, while it is a naturally occurring process, it does initiate significant changes in a woman's body, with their own impact on her physical and emotional condition. Women Menopause is not a single event in a woman's life, but a transitional process that takes place over several years, in most instances. The early phase of this process is called perimenopause or pre menopause, which is essentially the period beginning with the onset of menstrual irregularity, and ending with a woman's last period. During this time a woman's periods can stop for a while, start again, and then stop once more. Perimenopause represents the gradual shutting down of the reproductive functions in the body. The process develops differently in each woman, but there are some general characteristics associated with this phase that nearly all women experience to some extent. While these are the primary signs of the onset of menopause, there are others that frequently manifest themselves in many women as well. Moodiness, fat build-up on the stomach, and mild urinary problems can also be part of the picture. Fortunately, there are also a number of effective natural treatments for these menopausal symptoms.